Introducing KeTO1™ + KeTO2™, the easiest weight loss system: Just 4 capsules taken twice a day! You may achieve your weight loss goals in a natural metabolic state where the body burns fat for most of its energy rather than carbohydrates. 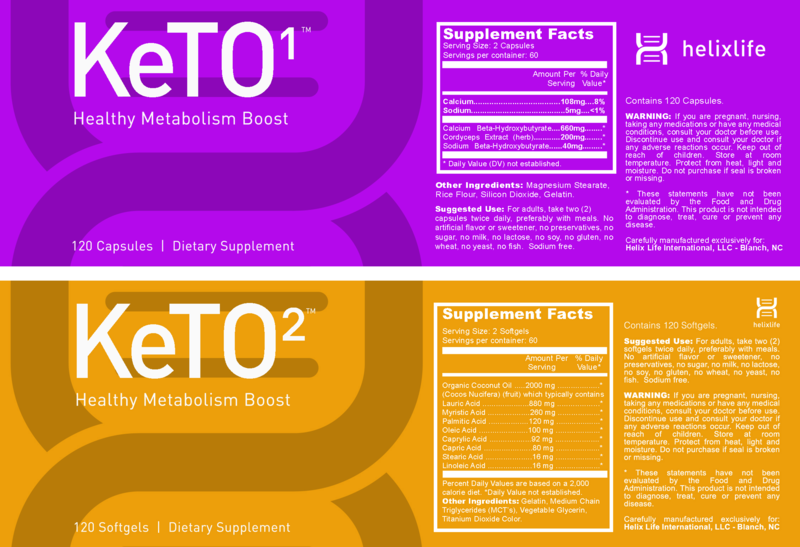 KeTO1™ + KeTO2™ provide the exact form of ketones your body naturally produces, recognizes and uses to direct you into that optimal fat-burning ketosis state. The Helix Ketogenic Diet System™ is the optimal way to not just help and keep you in ketosis, it may also energize your body and mind, as many of our customers have reported. The easy Helix Ketogenic Diet System™ May allow for a higher quality of life by helping you achieve healthy metabolism through enhanced ketosis. You will also learn to love our very simple suggested eating regimen and our convenient online support activities.